September 30 Pluto turns direct at 18 degrees Capricorn. Capricorn is the sign of governmental systems. Pluto turning direct asks us to look at many issues—power (and by extension—control, regulation, manipulation), research (investigation, hidden things, undercover), and most assuredly transformation. How we conceive of ourselves is interesting. We think of ourselves as individuals, and in Chinese terminology, this is a “yang” conceptualization. However, any complex entity, such as a human being, is a system that has a unique collection of collective elements. So, an individual exteriorizes elements of his individual selfhood that may already be shared by others, or may be registered by the minds of other individuals who could assimilate the elements. These then become common property of all people. They are added to the collective knowledge and collective experience of a culture and a civilization. Civilization is a process of the collective integration of the emanations of individuals. When is it within the collective, this is a “yin” conceptualization. Collective integration is the process by which energy, characteristics, and faculties of individuals become the properties of groups. In every person, the individual and the collective is occurring at all points in time. The process could be occurring in the body, the psyche, the spirit, and the social realm. The substance of the process can be in every dimension of being. The collective has formed who we are from what we have come to call the cells in our bodies to the ideas and language we use and understand. The substratum within which we are grown is the collective; the particular bloom we are becoming is our individual. Therefore, Pluto’s energies allow us to see how the systems around us operate and how we both participate and are affected by them—should we allow ourselves to acknowledge that there are things larger than the individual at play. Pluto confronts us with the collective parts of living that are beyond our control but which we would love to control if we were able. With stress aspects (square and sometimes the opposition), our control is, well, stressed or nonexistent. With benevolent aspects (sextile and trine—sometimes the conjunction), our control is enhanced and we often get to play the angel. When Pluto moves into retrograde (5 months of the year, generally), we often are able to be more introspective and internal. It is actually a period when we can focus on turning around our destructive tendencies. When Pluto turns direct, the focus shifts to others in the outside world—the collective. The time of reflection ends and the time of interacting with others outside of us begins. Saturn in Capricorn trine Uranus in Taurus. July 9-October 12, Retrograde/Direct Saturn in Capricorn trine Direct/Retrograde Uranus in Taurus (closest September 6). Uranus turns Retrograde August 9 (through January 6, 2019). Saturn is in a dance with Uranus and Chiron starting in July and moving through the months of September and October. This can portend an upgrade and/or major change to your value system(s), with Uranus in Taurus bringing in change to Saturn in Capricorn’s holding space for the systems and teachings that have gone before. In general, take advantage of adjustments to relationships and finances during these months. Changes that occur out of the blue are for your benefit. August 1 to October 19 (exact September 23-24) Saturn in Capricorn quincunx the North Node in Leo. Adjustments to expressing the self—based on a sense of responsibility to the world. You’re developing strength at this time, as you refine your ability to be a presence and to work in the world. While you are embodying your inner leader, you may feel the world is holding you back or you are not enough somehow. Rest assured, you’ll overcome this when you put in the work and effort. This is a GREAT time for hard work and effort! It would be in alignment with planetary energies. In fact, I would be hard pressed to find any of us who will not be putting out serious energy toward self-improvement, toward our goals/ambitions or toward building our skills for into a higher level. August 13 to November 6 (nearly exact October 10 and October 30-November 6) Uranus in Taurus square the North Node in Leo. These are fixed signs, and part of larger aspect patterns (T-square and grand cross patterns). I wouldn’t be expecting people to budge, and you may be surprised by the stubbornness you see around you during these times. Some people may be fixated on being crowned King or Queen (the Leo influence)—and they may be willing to do very unexpected things to get there. On the higher path, it is time to embody values that are more sustainable and earth-centered. Spend this time spiritually connecting to the earth and loving the planet. This can manifest in many ways—and with Uranus in the mix, how can we pretend to predict? In the past, Uranus (ruling the nervous system of both humans and the planet) has brought earthquakes and seismic activity. In social structures, Uranus in Taurus brought global fascism to the forefront in 1935-1942. However, on a personal level, Taurus is about what you value. Through the year 2026, the foundation of how we relate to our values and the planet is changing. Tension is denoted by a square aspect. The North Node in Leo can bring all of us to our personal crisis and our personal catharsis around our own values and ethics. I wouldn’t spend time trying to directly get others to agree with you, however, as each person will need to make their own decisions. Taurus is about embodiment—not conversation. The best way to convince others during these coming years is to clearly embody your personal values instead of speaking them. A human being and doing will be stronger than a human blathering and lying. Also, Taurus can tell the truth by how they feel in their stomach or gut. They’re very physical creatures. So, pay attention to when you feel queasy or uneasy, and make sure to rest enough to be in touch with your body. Slow down if you can and use body signals to guide you—not intellect or emotions or even the heavens. According to the stars, get grounded to get strong. September 23-October 3 (exact September 26-28): Sun in Libra trine Mars in Aquarius. You can both start and finish projects (and joint projects) with this influence. Mars in Aquarius provides a wonderful influence with its fixed-sign abilities to help you finish things, and the Sun in Libra allows for harmonious team work. This is also a wonderful aspect for date night and passionate romance. Your instincts should be on the money in all matters. October 1 to October 4 (exact October 2) Mercury in Libra square Pluto in Capricorn. This aspect portends a time when verbal communication can become heated or else manipulative. Sometimes Mercury can use the grace bestowed by the sign of Libra to distort the power drives of Pluto under a stress aspect such as this. Instead of shadow expressions, use this time to listen closely and think before you say anything. Perhaps you can uncover information about some of your own unconscious state of being. October 5 Venus Retrograde in Scorpio at 10 degrees. You’re probably already reflecting about your finances and partners. The Venus retrograde period lasts until December 18, when Venus bypasses 10 degrees Scorpio again to move forward on the wheel of the zodiac. Until then, Venus retrograde is going to ask us to review and look at what drives us and regenerates us, especially in regard to how we are in relationships. Then, when Venus moves back into Libra, partnerships of all types will be scrutinized. We will be ensconced in an energy that will ask us to look at how we operate and how that links into the wholeness of being on earth. October 5-15 (exact October 10) Retrograde Venus in Scorpio square Mars in Aquarius. It’s possible your passionate overtures will hit a wall. If so, chalk it up to Venus retrograde and move on. It’s temporary. Focus instead on steady progress, maybe of a more intellectual nature. It’s also possible that the blockage is circumstantial / environmental and not personal at all. October 5 to October 10 (exact October 7) Sun in Libra Quincunx Neptune in Pisces. Adjustments to group influences on our individual growth. New Moon in Libra, October 8 The New Moon in Libra is a chance to use the Libran symbol of the scales to set the focus to balance out the harmony in your life. With the Sun and Moon in square aspect to Pluto, both luminaries are asking us to use the Pluto in Capricorn energy to shed light on our integrity and build forms within the synchronies and macrocosms within which we sing in concert. October 8 to October 14 (exact October 11) Sun in Libra square Pluto in Capricorn. Energy is now shed by the Sun on how we are aligned with the new ideals and new social order being manifested (Pluto in Capricorn). Our personalities and destinies become slowly eroded and formed by the events–both graces and traumas—of the larger groups we inhabit, and aspects such as this one can be the catalysts for such personal and group formations if we observe from a more spacious vantage point. One of the possibilities in our lives is the allowing of ourselves to be changed in miniscule and macroscopic ways over time. October 10 Mercury enters the sign of Scorpio. During the time of Mercury in Scorpio, you may generate new thoughts like the ocean generates new species of life from its depths. There’s something deep and mysterious and significant brewing in our minds during Mercury’s transit of Scorpio. It’s also mental formations via our emotions. October 10-11 Mercury in Scorpio oppose Uranus in Taurus. Mercury/Uranus immediately seeks to integrate our lower mind with our higher mind as it engages straight on with Uranus. This can either drive us to brilliance or some temporary psychosis. October 10-11 Mercury in Scorpio square North Node in Leo. Mercury stirs up tension with the North Node for a few days during its movement, which means our destiny is touched by the planet that covers the things we say, write, send, our brothers and sisters, and our intellectual circulation in general. October 10-14 (exact October 12) Mercury in Scorpio sextile Saturn in Capricorn. As Mercury enters Scorpio the first few days, we can use the energy from this beneficial aspect to stabilize ourselves. Saturn provides the integrity to our words and deeds if we remain honest, open, and slow down when flashes and impulses try to steer us off track. It appears our best course of action is to stick with the plan. October 13-17 (exact October 12) Mercury in Scorpio conjunct Retrograde Venus in Scorpio. When Mercury and Venus meet, you may feel a deeper compassion, your values may be easily communicated, and you may get a sense that you can experience and convey the beauty of the mysteries of life. October 16-23 (exact October 19) Mercury in Scorpio square Mars in Aquarius. Drive safely and work on self-regulation during these days. It might be frustrating to watch how unfair the world is and you might want to write out your feelings if you feel that way. October 19-November 8 (exact November 1, 12:43 PM MST) Jupiter in Scorpio trine Retrograde Chiron in Pisces. We can acknowledge our mysterious fears/phobias, addictions, and obsessions even when we don’t fully understand them. There’s a final opportunity prior to Jupiter entering its own sign in November for us to delve deeply into the things that have been buried in our unconscious and have been expressing themselves in our behavior and in our group consciousness. One possibility is your encountering ways that help you heal—people or resources. We can look to our histories—past lives, built cultures, childhoods—and see beneath the surface to the roots of our taboos, unconscious desires, and those things that have been swept under the rug for too long. As we examine the shadow parts of ourselves and our partners, what attracts or repulses us? What does that symbolize for us? And, if we are a phoenix, burning in the fire at this moment, what parts of us do we want rising from the ashes when we are remade? October 21 Sun in Libra quincunx Chiron in Pisces. During this time, it’s possible to feel the pain of the collective unconscious. Also, personal pain can be exacerbated. If you are a healer, take some extra steps toward immunity if you like. Bathe in light, water, sage, or in general… stay well. Pass on healing vibes to others if possible, on an energetic level. October 19-24 (exact October 22) Mercury in Scorpio sextile Pluto in Capricorn. This is a good time to get into the deepest of subjects—whether that be psychologically, physiologically, spiritually, or socially. With both Scorpio and Pluto involved in this aspect, here is your chance to solve some puzzles that are mysterious and powerful. Whatever you’re interested in, please dive in! Research and uncover some truths. October 19-28 (exact October 24) Retrograde Venus in Scorpio sextile Saturn in Capricorn. This is a true love aspect, even though Venus is retrograde. Saturn is at home in Capricorn and any connections made now are strong and serious. This is an aspect that signifies the need for long-term commitment. Love and value those around you to take advantage of the energy of Venus/Saturn. It’s also good for business investments and commitments. October 23 Sun enters Scorpio. Scorpio is the sign of the scorpion / eagle / Phoenix-Dove. At various stages of maturity, a Scorpio energy could be self-destructive and sting like a scorpion. Next, Scorpio energy could show up like the Eagle, with a self-awareness that uses intellect (but still swoops down on prey from the sky). Also, a Scorpio energy can be found when the transformation of a phoenix has occurred (when Scorpio has allowed themselves to die to who they were and be reborn) and a dove of peace has emerged. Only Scorpio has this power to turn venom into peace. And Scorpio transformation has the potential to occur faster than any other sign. See where this cycle’s energy occurs in your environment during the time of Sun in Scorpio. Full Moon in Taurus 1 degree, October 24 10:45 am. The Sun is conjunct Retrograde Venus and the Moon is conjunct Uranus, giving a lot of focus to the Scorpio/Taurus polarity (opposite zodiac signs). Both are fixed signs based in strong desire energies. The Moon/Uranus trine Saturn in Capricorn. The Sun/Venus sextile Saturn in Capricorn. The Taurus energy is driven toward stability and resources. The Scorpio energy is driven toward understanding and creative union. Both are patient, deep, yin, and receptive. Taurus shapes the world while Scorpio shape shifts within the world. October 23-31 T-Square in Fixed Signs at 0 degrees. Sun and Venus in Scorpio Opposing Uranus (and Moon and Full Moon on October 24). Both configurations square to North Node in Leo. This configuration is a conflagration of stressful aspects that will test your resolve prior to the North Node moving into Cancer. The questions destiny will be asking humans: what in your relationship history has empowered or disempowered you? What have you done with the resources you have been given to uplift others? What creative efforts have you put forth to manifest the ideas that have been given to you? How have you learned to be in the physical world gracefully? What does it truly mean to be a human being? October 24 to October 29 (exact October 25) Sun in Scorpio conjunct Venus Retrograde in Scorpio. This aspect only happens once a year, and generally it shines a light on love, peace, and sociability. This year, Venus is retrograde and in the sign of Scorpio, and both the Sun and Venus are square to the North Node and opposing Uranus, although sextile to Saturn. It portends a more serious year based upon how ethical and disciplined an individual has become. If you have passed Saturn’s tests in your life; fine. Have fun. If you’re integrity can be compromised—look out. The sun can burn as well as brighten. October 23 to October 27 (exact October 24) Sun in Scorpio square North Node in Leo. This solar aspect work in conjunction with Venus to review how our individuation works in concert with our ability to value others. The world will reflect back to us how well we’re doing in our evolution during these days. Try to pay attention. October 24-November 3 (exact October 30-31) Retrograde Venus in Scorpio square North Node in Leo. This is an opportunity to see the tension between how the desire to create a future that meets the vision of one individual can fail to accommodate a deep dive into the needs of relationships and truly meet the standards of what would be needed in partnership with others. It’s an opportunity to review what is meaningful about true desire and leadership. October 24- November 3 (exact October 30-31) Retrograde Venus in Scorpio oppose Uranus in Taurus. When you receive a call from your long lost ex-lover who wants to be reminded that there was a reason you’re no longer together… When you receive a strange, out of the blue offer to buy your house… When you suddenly need to redecorate your third bedroom into a place to hold Japanese tea ceremonies even though you were raised Lutheran… When you suddenly wish to try neon purple on your hair and feel inspired to try a modeling career in South America even though you live in France… It could be Venus opposing Uranus. Use vision boards instead of acting on these impulses. Please. And curb the spending. October 24-28 (exact October 26) Retrograde Venus in Scorpio conjunct Sun in Scorpio. Emotions are running high around attraction, (sexual attraction with Scorpio! ), money, creativity, and romance. You can burn a little brightly so don’t overdo it with Venus retrograde, but in general, this is an extremely favorable aspect for relationships of all sorts—including romantic ones. Love and affection rule the day. October 23 to October 26 (exact October 23) Sun in Scorpio Oppose Uranus in Taurus. Genius or madness is highlighted. There may be restless, anxious energy. There also may be an air that there are intuitive insights available like apples on a ripe apple tree—right there for the picking. Try to express your ideas so they don’t come out via accident prone behaviors. October 24 to October 31 (exact October 27) Sun in Scorpio sextile Saturn in Capricorn. You may be surprised that you have lots of energy and will to power through projects during the days just prior to the end of October. October 26-30 (exact October 28) Mercury in Scorpio trine Chiron in Pisces. You might find yourself shifting your thoughts in a positive manner about an emotional situation or a spiritual path. This may be the result of information acquired from a wise elder or a resource that comes to you in a dream, a book, through a communication, or from spirit. Spend time near the water if possible. October 26-30 (exact October 28) Mercury in Scorpio conjunct Jupiter in Scorpio. Jupiter transits cause the ego to have expansive and compensatory types of soul release. In Scorpio, and with Mercury, this can be truly magical. Use this time to be near the water if you can. Focus on what is real about your being. Use your mind to connect to your deepest experience of humanity and think about what will expand your life for the next phase. October 30 Mercury moves into Sagittarius at about 11 PM MDT. The big picture. Freedom. Defending Justice. Mercury in Sagittarius will help us have the expansive, optimistic vision. Just ignore the little holes you see in the tires where the air is leaking out. You may see lots of fun and positivity during this time frame. Also, watch out for moralizing and preaching. It’s easy to get dogmatic when your mind is on Sagittarius time. October 31, Afternoon, Venus Retrograde changes signs to move back into Libra. Venus now focuses upon the humanitarian ideal in partnerships. Libra is an air sign and Venus is at home in Libra. Venus uses its time in Libra to create peace on earth and equal rights. Venus says that every human has value and each partner in a relationship has equity. This is the year to dress up as the Notorious RBG if there ever was one. October 30-November 3 (Exact October 31) Mercury in Sagittarius trine North Node in Leo. The North Node is getting ready for a big change into Cancer, and this aspect is all about change. Here’s an opportunity to take one last look at your self before the focus changes to caring for others. It will be a favorable look. Truly take a pause to appreciate and love yourself. You are so loveable! Let me know what you think! Send an email to domikajama@gmail.com. 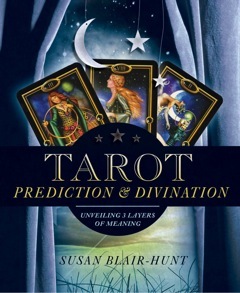 You can learn so much about Tarot from Susyn Blair-Hunt, my wonderful mentor, in her book, Tarot Prediction & Divination, Unveiling 3 Layers of Meaning. Elizabeth Battarbee of Flourish, Doctor of Homeopathy – available via Skype everywhere and in-person in Louisiana! Elise Hensley, LISW, an amazing healer, specializing in EMDR and Neurofeedback. Elise is one of only a few people trained in Neurofeedback in our area. She is someone who is a skilled and amazing mentor. Better yet, your insurance may cover your sessions. Thank you for enjoying this month’s newsletter! You can contact me anytime via email: domikajama@gmail.com for consultations. Visit at Intuitivemoon.com. This entry was posted in DominiqueNewsletter on September 26, 2018 by intuiti. To schedule a reading, pay at least 24 hours in advance and then contact me to find a time when we are both available.